Easter Brunch is always a fun occasion, family, friends, and LOTS of food. That’s why I’ve compiled 10 Healthy Recipes for Easter Brunch. These are healthy versions everything from waffles and muffins to quiches and omelets…and of course, a couple of fresh salads perfect for spring. Many of these dishes can be easily prepared ahead of time, so you can enjoy your Easter egg hunt without breaking a sweat in the kitchen. 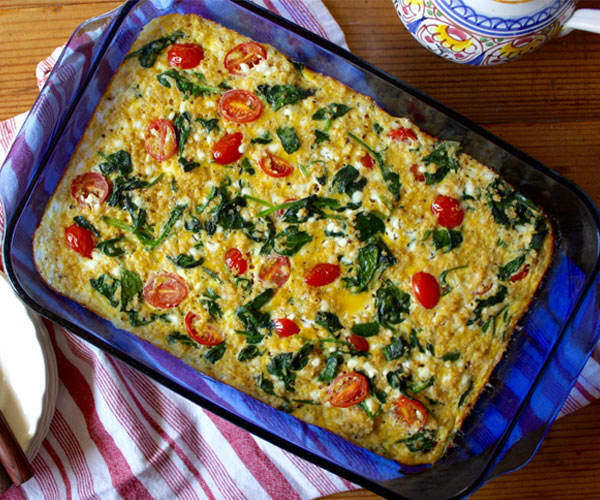 Frittatas are a healthy alternative to quiche, and easier to make. 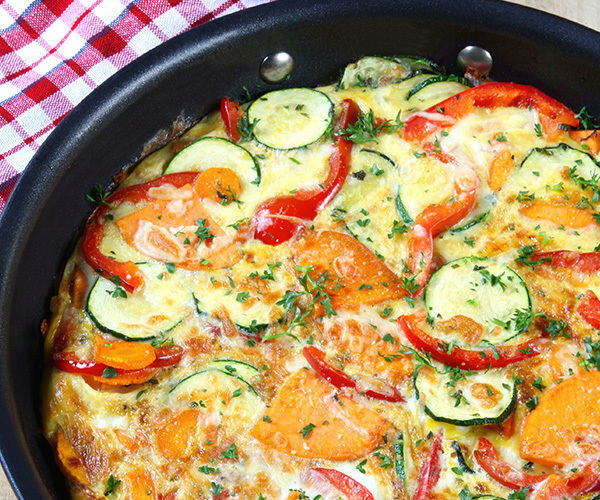 Our zucchini, red pepper, and sweet potato frittata recipe tastes delicious. It will be the star of any brunch. 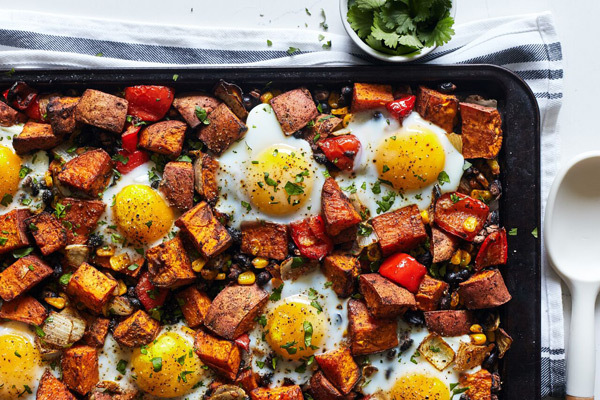 Spiced with fragrant cumin, chili, and smoked paprika, topped with fresh cilantro and filled with fresh veggies and beans, this brunch dish is so filling, you’ll want to eat it for dinner, too. If you’re looking for an easy breakfast that can feed the whole gang, this is the ideal dish to whip up in a pinch or just an opportunity to strut your superior brunch-making skills. 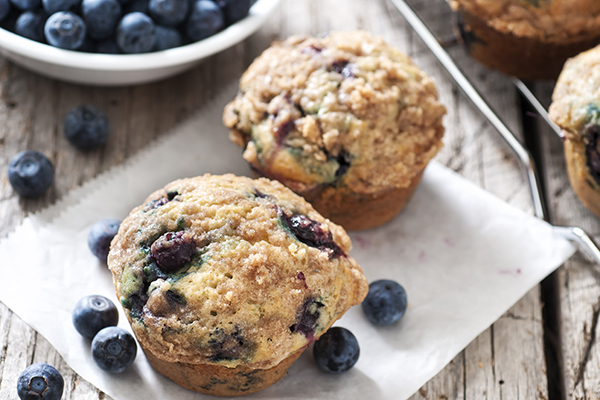 These blueberry muffins taste — and smell — incredible. One whiff of them fresh from the oven and you won’t be able to wait until they hit your plate! Get the recipe. 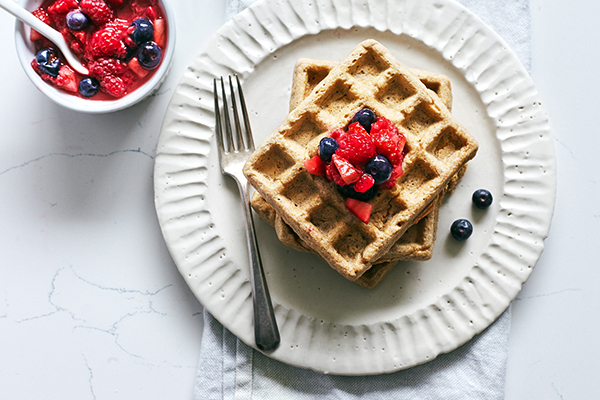 Skip the refined white flour — our waffles are made with cashews and oats for healthy fats and whole grains. If you have any left-over (which is unlikely), freeze them and pop them in the toaster for a quick weekday breakfast. Get the recipe. 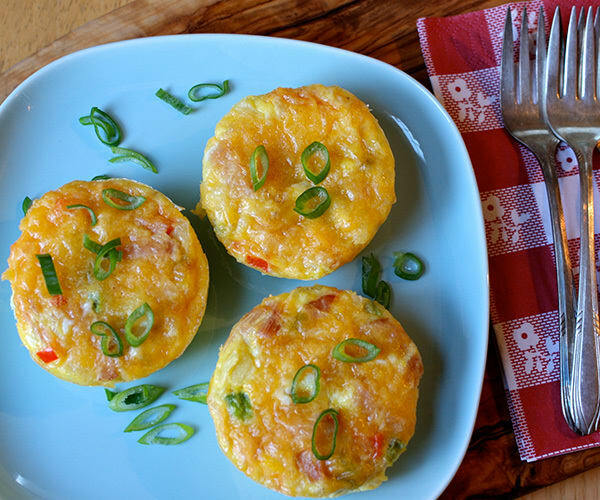 These mini Denver quiches with ham, cheese, and bell pepper are perfect bite-sized appetizers for brunch, and they make a great grab-and-go breakfast! Get the recipe. The classic Benedict made with ham or Canadian bacon, and smothered with buttery hollandaise sauce is only the beginning. 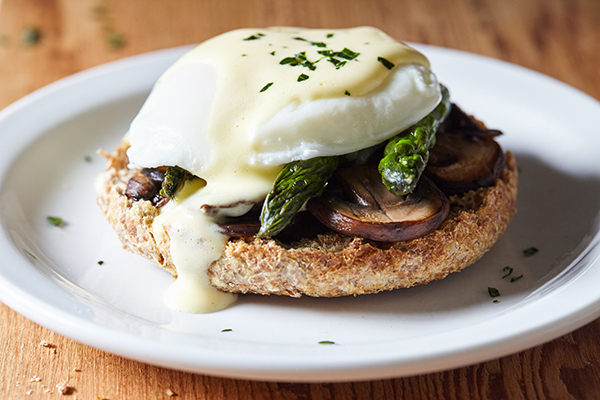 This vegetarian eggs Benedict with sautéed asparagus and mushrooms and a much healthier version of hollandaise sauce is a delicious way to get your brunch on. Spring is finally here! 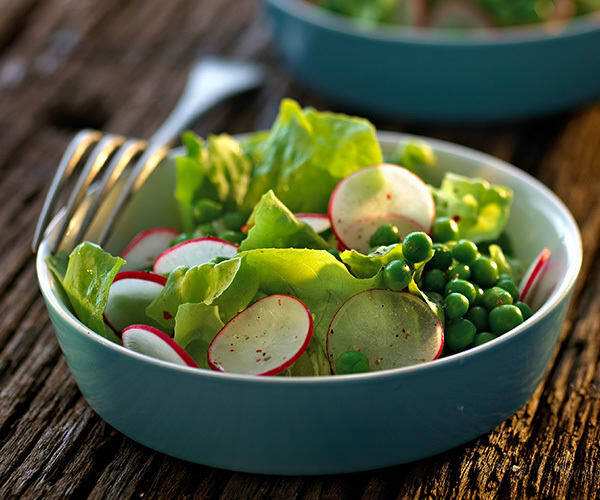 This salad, made with fresh peas, sliced radishes, and a lemon vinaigrette is the perfect way to celebrate the end of winter. Get the recipe. The best part is that this recipe is incredibly versatile: Use it as a template for other delicious combinations. Swap spinach and tomatoes for any other vegetables you like. We made this breakfast casserole vegetarian, but it would also taste great with pieces of lean ham, turkey bacon, or chicken breast. Get the recipe here. 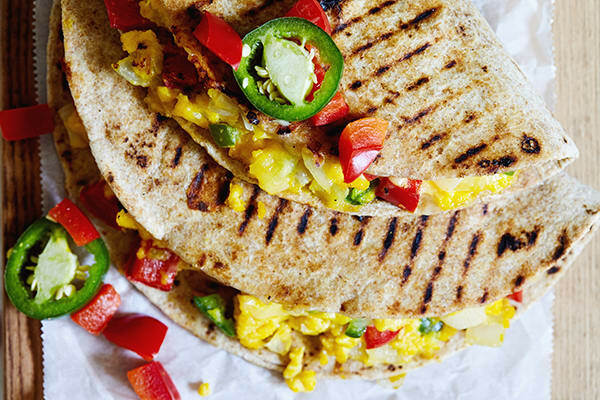 Who can resist the combination of colorful veggies, protein-packed eggs, and melted cheddar cheese?! It’s basically a grilled cheese with boosts of protein and a little fiber. Even picky kids can get on board with this dish! 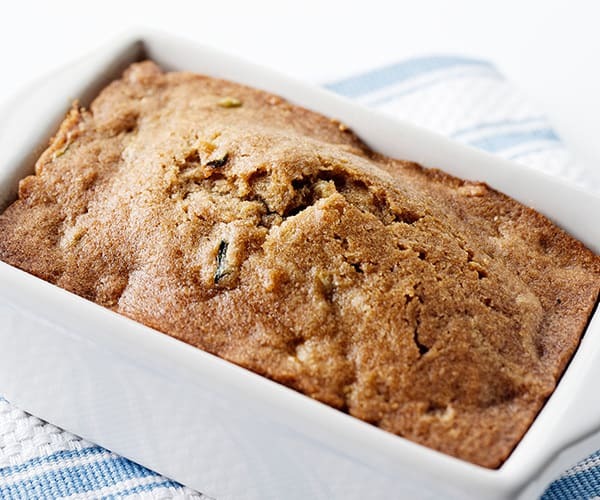 Our healthier take on zucchini bread has all of the moisture and flavor you expect in a good slice of zucchini bread, thanks to apple sauce and coconut oil. Get the recipe.